Even if you have only one iPad there are still lots of ways you can use it with your students, especially if you can plug it into a data projector and speakers. Midnight Music have presented 18 practical ideas for teachers. Go to teh link for the full list of ideas. Many of these ideas are also great for students to drive themselves or to work in small groups. Connect your iPad to the data projector and fire up the app. You are the one to operate the app and start the note identification game. As notes appear on the screen, students can write down the note names on a piece of paper. You can secretly identify the note correctly, leaving it as late as possible so students have the maximum time to come up with an answer. You’ll also need to make a note of the correct answers as you go! At the end, students can correct their answers. This would work well as a team game. With your iPad connected to the data projector, start up one of the levels in the Rhythm Cat app (or something similar). The rhythm that appears on the screen can be played by the class as a group – using body percussion or classroom instruments. 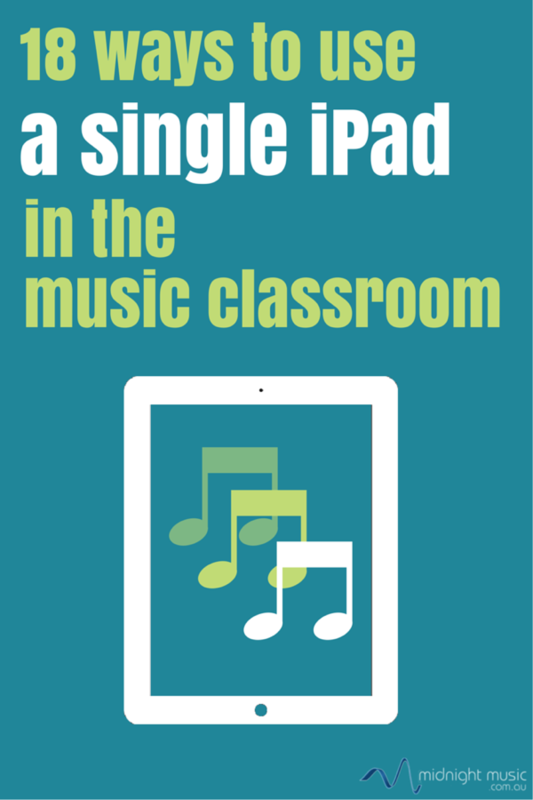 Students (or you the teacher) can tap the rhythm on the screen of the iPad. Set up a drum pattern in GarageBand (use the Smartdrums to generate a quick rhythm), Drumjam or DM1 in a style of your choosing. Use the drum pattern to accompany class ensemble arrangements, or scales in band/orchestra/choir rehearsal. Much more interesting than a plain old metronome!